We previously reported a figure by The Consumer Product Safety Commission that in 1998 there were over 12,000 visits to emergency rooms by 5 to 18- year-olds due to backpack-related injuries (see Backpacks and Ergonomics). They have since reported that in the year 2000 there were 13,000 ER visits by children for this problem, and in fact this figure represents a 330 per cent increase since 1996. In a recent survey done by the American Academy of Orthopedists, 60 percent of the doctors reported seeing children complaining of pain resulting from backpack related injuries. Middle school children are particularly affected due to the fact that their connective tissue must keep up with the pace of their rapidly growing bones. The added stress to their tendons and ligaments has led to complaints of headaches, neck pain, muscle spasms, tingling into the hands and low back pain. Parents need to be aware of these problems signaling overloaded backpacks. In addition, any posture that deviates from a normal upright position while wearing the backpack is also an indication that the weight is excessive. The weight should not exceed 10 to 15% of the child’s total weight. The bottom of the pack should end ideally at just a few inches above the waist but definitely not more that 4 inches below the waist because below this point it creates excessive strain of the upper back muscles. Health concerns have even led to the passage of legislation being passed in California and New Jersey to limit the weight children are expected to carry on their backs. Parents should look for ergonomically designed backpacks such as the Airpack. It is claimed that the Airpack reduces 80% of the stress to the user and decreases the load by 30%. 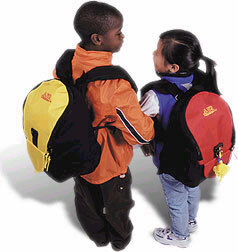 It is also one of two backpacks endorsed by the American Chiropractic Association.